Choice Provisions and Accolade today announced the release date for Bubsy: Paws on Fire!, the ambitious game that appears to be a mix of the BIT.TRIP style with the Bubsy universe. In addition, physical editions of the game have been revealed for both PlayStation 4 and Nintendo Switch and will be available later this year. 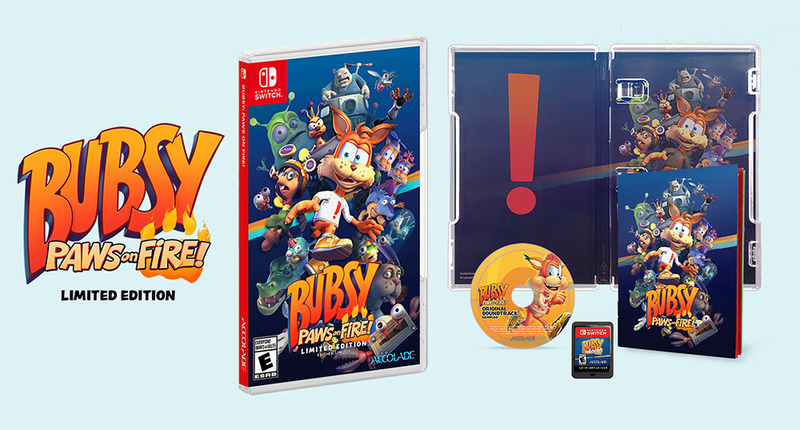 The Limited Edition Physical version of the game will contain the base game, a CD sampler of the game’s OST, a deluxe Player’s guide, which will contain never-before-seen pictures of Bubsy and his crew. The Nintendo Switch version will have a reversible cover. Along with auto-running gameplay, Bubsy: Paws on Fire! will contain four playable characters with their own mechanics, over 140 levels across three different worlds, three different boss battles, a shop with costumes and cosmetic items to be unlocked in-game, and a return of fan favorite characters from Bubsy’s past. Bubsy: Paws on Fire! will be released digitally on May 16th, 2019 for PlayStation 4, Nintendo Switch, and PC via Steam. Earlier today, we did an interview with “Bubsy” himself. Check it out over here.